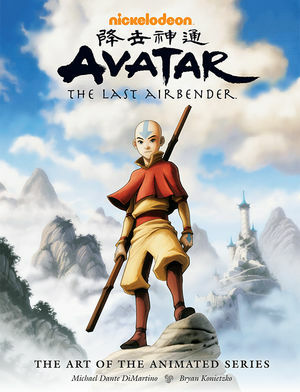 The Art of Avatar is a Must-Have! Well, with this Avatar-based art book project, Dark Horse sail high on the winds of high-interest material and leaves my above “truism” well behind. For the fan of Avatar: The Last Air-Bender, this book is an absolute joy to read and look at. As a resource, it provides a history of both the story and art of the series, it reveals some earlier versions of characters and concepts. It gives a season by season, episode by episode evolution of ideas and story lines direct from the mouth (text) of the creators themselves. By reading their commentary, you can tell they loved their creation and thoroughly enjoyed the process. For those of us who live in and understand the world of fandom, this art book sets the bar for a series companion book. For those among us that have not seen the animated series (I think it would be nearly impossible to have watched the series and not fallen in love with it), this book would serve two purposes – first, it’s a beautiful text that academically helps diagram out the creative process for a highly successful property which would be enjoyable to anyone who has an ounce of imagination and second, it’s a perfect primer for the upcoming live-action movie (the cynic in me can’t help but notice the timing of the publishing). Even taking into account my own skepticism, I can’t help buy highly recommend (like put you comics on hold for few weeks to buy this) this gorgeous coffee table book. This hard cover with 184 pages of personal stories, character and production art, character sketches, inspirations and relevant casual conversation makes the $35 price an unbelievable deal. Bottom line: order it, buy it, own it!